As a youngster, I was aware of American standards of hygiene. In the 1970s and early 1980’s it was obvious that people in the USA had showers every day, clean clothes, dental treatment that gave them perfect teeth and they probably laundered their towels, too. But the UK trailed behind on hygiene. Most people didn’t have showers; they had a weekly bath. Or they washed their hair with a rubber fitment that squeezed on the tap. Crikey, my mum even washed my hair with Fairy Liquid once a week and rinsed it with bath water scooped up in an old saucepan because we didn’t even have a rubber hose fitment. People would wear the same trousers or shirt all week, and you’d never wash a jumper because it was too difficult to get it dry again. Cosmetics and deodorants were only for those ladies who were a bit fancy. Young men would be thought a bit odd if they washed their underarms and put on something with a scent, and perfume in general was for special occasions whoever you were. Add to this the nature of some punk clothes. My granny jackets from jumble sales were strictly ‘Do Not Wash’ so I didn’t. 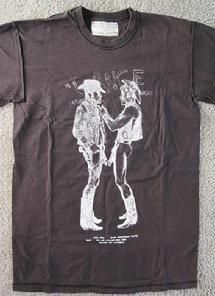 And my friend had a genuine Westwood/McLaren Seditionaries obscene cowboys T-Shirt which needed to be worn every day so it couldn’t possibly be washed. Add in the pogo-ing sweat, the gobbing and the dirt from those 1970s corporation buses and many punks may have been a smelly lot by today’s standards. 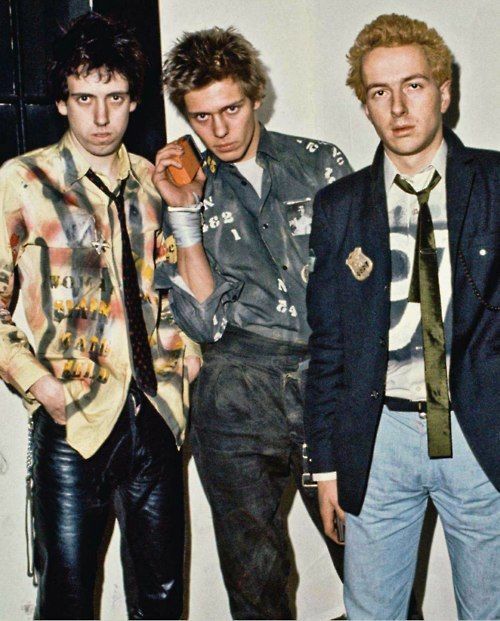 In this long interview about the punk era, the best part is at 34’06 where Viv Albertine of The Slits recalls Mick Jones of The Clash – proud owner of a pair of leather trousers…..
We’re all older now, and even the men seem to be sweet-smelling and freshly-laundered these days. But I’m not at all nostalgic on this one!